DOT’s plans to redesign two Prospect Heights intersections to improve safety earned the endorsement of Brooklyn Community Board 8’s transportation committee last Tuesday. The plan also includes an “optional” painted bike lane along Washington Avenue between Eastern Parkway and Atlantic Avenue [PDF]. The biggest changes are in store for the messy five-spoke intersection of Washington, Atlantic, and Underhill Avenue, where cars are turning in all directions and very long crossing distances make conditions hostile for pedestrians. 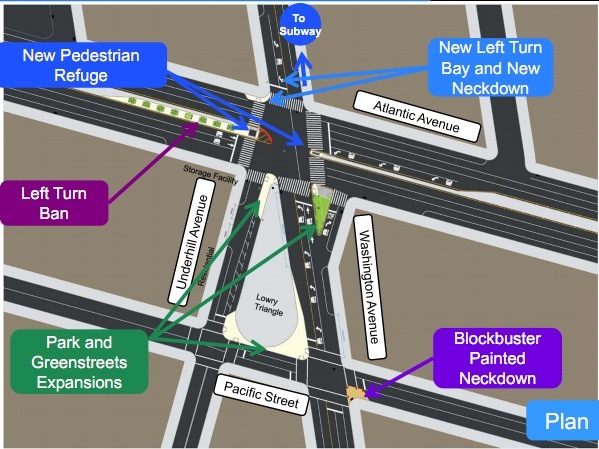 The plan calls for a new pedestrian refuge island in the middle of Atlantic Avenue and a ban on left turns from Atlantic to northbound Washington. A neckdown is slated for the northwest corner of the intersection, and pedestrian space around the triangular park between Underhill and Washington will expand substantially. Additionally, a super-sized, painted “blockbuster” neckdown is planned for Pacific Street and Washington Avenue. These changes come after a local organizing campaign led by architect Jeff Sherman, who helped gather 337 signatures on a petition for safety improvements. They also come after the death of cyclist Jasmine Herron, who was doored at the intersection of Atlantic and Washington last September. From 2005 to 2009, eight pedestrians, five cyclists, and 98 motor vehicle occupants were injured at the intersection, according to the DOT presentation. A few blocks south, Washington again forms a five-spoke intersection, this time with Park Place and Grand Avenue. 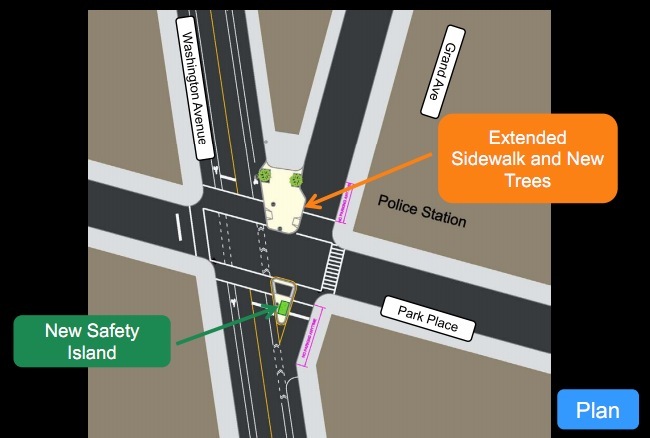 There, a major sidewalk extension is planned for the north side of the intersection, a location where today police cars sit on the corner with impunity. A new traffic island will be installed on the south side of the intersection. One way to do that would be to stripe the extra space as a bike lane, a proposal included in DOT’s presentation. However, the DOT plan that the transportation committee endorsed lists the bike lane as “optional.” We asked DOT just whose option it is and did not receive a reply. The transportation committee did not spend much time discussing the bike lane, according to chair Frederick Monderson, focusing instead on the two intersection redesigns, but insofar as the DOT plan did call for bike lanes, they were included in the endorsement. The CB 8 transportation committee had already unanimously endorsed the redesign of Washington and Atlantic in February, but voted on the entire proposal last week. Since February, the plan had also been amended to accommodate the concerns of certain local businesses about parking. “DOT seems to be bending over backwards to be community hospitable,” said Monderson. While the redesigns will remove around 40 spaces in total, according to Monderson, a few were added back by DOT by shortening certain bus stops and working with the Fire Department to either reactivate or eliminate non-functional fire hydrants. Even with those alterations, some merchants tried to delay the passage of a resolution in support, but they were outvoted at the transportation committee. Now we just need the Eastern Parkway reconstruction project to finish the intersection of Washington and Eastern Parkway for the whole avenue to be safe in Prospect Heights. The merchants on Washington Avenue were heavily involved in the design discussion, and that is to the credit both of DOT for being good responsive listeners, and of the merchants for recongizing that good street design can help them succeed. I stopped biking on Washington because of that problem of the more-than-one- but less-than-two-lane business. Livery cars and cabs were especially crazy about wanting to get to the lights faster by gunning it up the quasi-lane. Once they painted sharrows on Vanderbilt, I moved my commute over to there. And the reality is that I basically don’t shop on Washington now, even though it would be better for me; I shop on Vanderbilt. Push for a real bike lane, Washington Street merchants! What do you mean 40 parking spots are removed? You say 40. That’s lot. That would be net of the number added in by the Fire Dept. and the MTA. This can’t be due to the crosswalk bumps. Why so many? That’s a lot of unsatisfied customers (40 spots X 10 turnovers per day = 400 visits). Will these spots be filled by MV’s with municipal placards. This near to the planned HRA facility. 10 turnovers per day? What fantasy world is this? I was at the presentation and the parking spots are being replaced with loading zones during the day to prevent double parking and they will revert back to normal parking in the evening and at night. Atlantic and Washington Gets Fixes, Now What About the Rest of Atlantic?